Community-Centered Celebrations are an on-going process of deepening and broadening a spirit of companionship and community between supported persons and their circle of friends. These times honor the Individual and reflect on the journey toward companionship and community, and also dream about what is yet to come. These celebrations, organized four times throughout the year, require active participation from the Individual and their circle of friends. During the celebration, the group reflects on the person’s feelings of being safe, engaged, and valued, and also their actions that indicate reciprocating value. 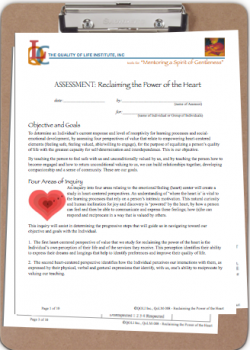 For measuring progress toward the Individual’s goals, we use a a quality-assurance assessment called “Reclaiming the Power of the Heart.” This phrase expresses our objective to empower each Individual by improving his/her quality of life with help. In the assessment, there are four areas or “chambers” that are reviewed, as we strive to equally balance a person’s quality of life. For a community receiving a Quality of Life model of services, they gain a local resource that can provide quantitative and qualitative methods and data, to assist in areas of research, quality enhancement, quality assurance and policy development. It is important to understand how the Quality of Life model of services interacts with the Individualized Support Plan (ISP) and the Personal Centered Plan (PCP). These two plans were developed by the Bureau of Developmental Disabilities Services (BDDS) to establish the standards and requirements that are needed to document our services. 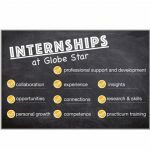 This document is a tool that helps all of us at Globe Star to understand the relationship and the differences between the QoL Model and the ISP and PCP to our agency. Please note that the ISP identifies the short and long term outcomes that are based upon the Individual’s preferences, desires, and needs from the Person-Centered Plan. This PCP process identifies four key areas to enhance the quality of life for the Individual receiving services. As a team member who is a part of developing the ISP, it is important to clearly identify the information that is needed to collect these outcomes from the objectives that were developed through the participation of the team and the requirements during this celebration to agree with this ISP for the Individual receiving services. (See Title 460 IAC 7-3-7 through 460 IAC 7-5-8). With our services, we account in two ways that relate to improving quality of life for Individuals. One side of the QoL model is quantitative because it can be measured objectively (Teaching Form) and subjectively (Quality of Life Sheet). The other side of the model is qualitative because of the need to describe one’s quality of life (see Table 1 insert). It is important to identify that both methods are necessary to facilitate the Quality of Life Model’s validity and reliability to provide for positive future direction in enhancing the lives of Individuals. The application of this model from the above areas assist in the collection of information in which the team shall be cognizant of the past, present and future influences of a variety of factors that define the Individual’s quality of life (460 IAC 7-4-2). The service delivery of the QoL model has four areas that facilitate the overall enhancement of the quality of life for the Individuals we serve. The first area of the delivery service is to enhance the quality of life for the Individual receiving services. The second area addresses the service delivery and improving the interactions of the direct service worker. The third area identifies the celebration of this companionship and finally the fourth area identifies with us the outcomes of the services one has received. (See 460 IAC 7-1-1 through 460 IAC 7-3-17). The initial delivery of services begins with the identification of assessing one’s quality of life values, sense of companionship and community, quality of life elements and the quality of life assets. These four assessments provide the foundation for the quality of life plan. This plan gives the direction for us to improve the quality of life for the Individuals we serve. This direction provides us each day with the actions, formal and informal and the unconditional valuing that facilitates the four primary goals of being a caregiver. First, teaching the person to feel safe with us, second, teaching the person to feel engaged with us, third, teaching the person to feel unconditionally valued by us, and finally, teaching the person to return unconditional valuing to us. It is these four goals that will nurture one’s sense of companionship and community. These goals can be accomplished through the PCP and ISP process by the Individual’s support team. (460 IAC 7-3-4 & 460 IAC 7-3-10 & 460 IAC 7-3-17).